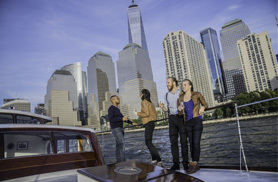 The Yacht Full Moon operates right out of North Cove Marina which is just steps away from the inspirational Freedom Tower and the heart moving 9/11 Memorial. After a day of sightseeing, walk on over and cruise with us to see this amazing city from the waters perspective. 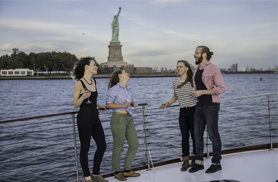 Cruise out into NY Harbor aboard our classic yacht and relax with friends or family to view the amazing NYC Skyline and get up close and personal with the Statue of Liberty. 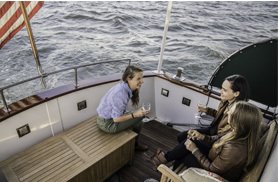 Grebe Yachts: What is a Grebe Yacht? Henry C. Grebe & Company was the successor to Great Lakes Boat Building, which had started in Milwaukee in 1915 and moved to Chicago in 1921. Grebe was famous for the style and quality of the leisure yachts he designed and built. It was located on the west side of the North Branch of the Chicago River, just north of the West Belmont Avenue Bridge. They built their last boat in 1970 but did not finally close until 1994. 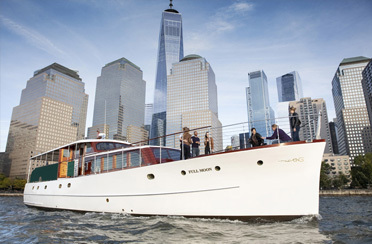 The Grebe yacht acquired by Classic Harbor Line, Full Moon, was a 65 foot production in 1950. Another 65 foot production they completed a decade later, was “Florencia”, later renamed, “Sam’s Place”, which was obtained by the famous actor and comedian, Jerry Lewis. Jerry used the boat for leisure and relaxing with family in the San Diego area. This photo of “Sam’s Place” is comparable to the spirit and look of Full Moon once she is fully restored. 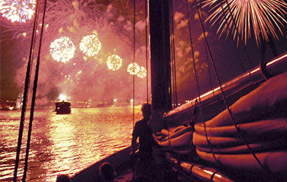 Join us for a 4th of July Fireworks celebration aboard this vintage style yacht; Full Moon built in 1950. 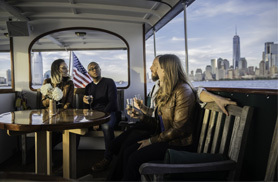 This yacht offers you great views of the Macy’s July 4th Fireworks, Statue of Liberty and NYC skyline, from its forward open air deck, or its covered open-air aft deck observatory. 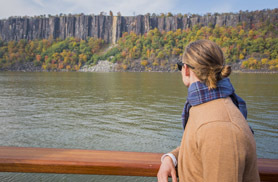 This cruise is limited to only 20 passengers offering a intimate and up close view of this epic event. Enjoy passed hors d oeuvres, light stationary displays and dessert along with a complimentary standard open bar. 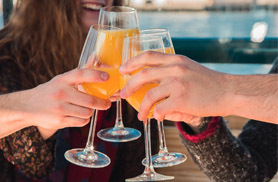 (Beer, Wine, Champagne and soft drinks) Enjoy this magical evening of the most spectacular display of fireworks in the nation!